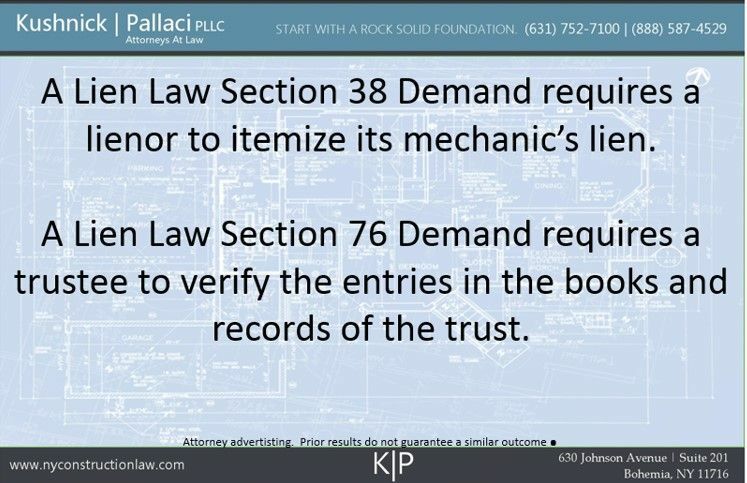 Kushnick | Pallaci PLLC was recently successful in a Suffolk County action in obtaining an order requiring a lienor to itemize its mechanic’s lien pursuant to Lien Law Section 38 and to provide a verified trust fund disclosure statement pursuant to Lien Law Section 76. The decision may be viewed here. 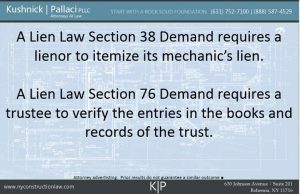 Lien Law Section 38 allows a contractor or owner that has been served with a mechanic’s lien to file a formal demand that requires the lienor to itemize its mechanic’s lien. Once served with the Lien Law Section 38 demand the lienor has five days to respond. If he or she does not, then the person service the Lien Law Section 38 demand can file a special proceeding to compel the lienor to respond. Lien Law Section 76 allows a beneficiary of a trust to demand that a trustee serve a verified statement setting forth the entries on the books and records of the trust. If the trustee does not properly respond to the Lien Law Section 76 demand then the beneficiary may commence a special proceeding to compel a proper respond to the demand. Trust diversions can be discovered through responses to Lien Law Section 76 demands and those diversions can lead to trust diversion class action litigation. This entry was posted in In the News, Itemization of Lien, Lien Law Section 76, Mechanic's Liens and tagged Lien Law Section 38, Lien Law Section 76, Liens by VTP. Bookmark the permalink.